This is settling into a deeper presence. 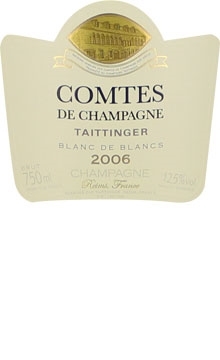 It has a freshness that really appeals, along with Taittinger's signature toasty layer of autolysis, grilled nuts and praline. Plenty of flesh and weight on the palate. Acidity clasps ripe peach and mango fruits, finishing long, powerful and fine. Drink now. Light yellow. Refined, elegant nose still in its youth, intermixing floral scents, herbs - angelica and fresh mint - and subtle toasted undertones. Ample, ethereal, silky palate displaying supreme harmony. A particularly successful bottling.